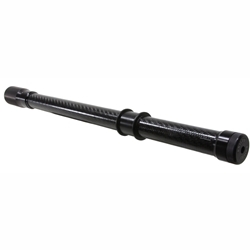 The main body of the extension is carbon fiber to which aluminum ends are attached allowing the use of our regular forend caps and end caps. The carbon tube has a Delrin collar. Barrel clamp and spring included. Extensions are sold with a black anodized finish on the aluminum but Blue, Gold and Red is available on request and will take approximately three weeks. Note: The clamp spacer position on the extension is good for any barrel 24 inches or longer. Shorter barrels will require custom positioning of the spacer. ***If you shoot 3 Gun and would like a Briley dedicated 12 round, 3 Gun carbon extension (manufacturer specific), please see them HERE.